An article by Josie Appleton, titled Towards Human Species Consciousness, asked if a world shaped by humanity was necessarily a bad thing. She went on to suggest that a broadening of perspectives of our current relationship with nature is needed if we want to live in harmony with nature. To her, art would be able to provide the gravity of future possibilities to explore, both the euphoria and grandeur of acting consciously as a species, and the awesome sadness of messing up and losing. These photographs document the existence of human actions and natural processes in ever-changing combinations. They were taken in a neglected empty space that exists between public and private land. It is a celebration of humanity as a producer of nature, that we are a part of nature, not apart from her. It is also an investigation into the sublime attraction we have for nature, an attraction that requires a nuanced understanding of our human relationship with nature and at the same time an understanding that the relationship is highly ironic in these turbulent times. These spaces also offer a constant reminder of the resilience of nature. These photographs explore questions of place. The unnamed environments exhibit clear detail and nonspecific location. 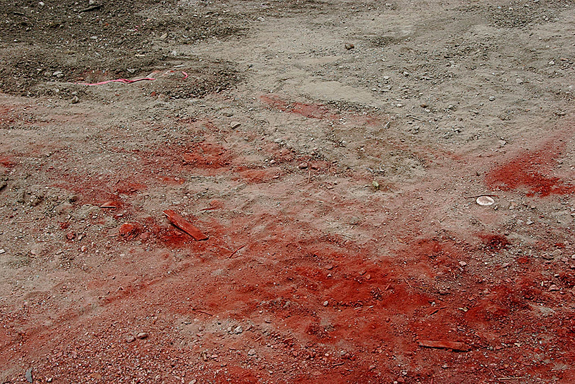 The images point to particular things, yet no identifying information is gained and the unsettling sites at times bear likeness to a crime scene. These are not precise documents — the photographs are not exact records and do not describe particular locations. Instead these are places unnoticed and vulnerable. The visible marks and traces left behind could easily be erased, removing any certain history or evidence. The clearest sense of orientation in a landscape’s depiction lies in the location of the horizon line. Here the horizons are often eliminated, rendering the viewer slightly off balance, searching for direction and clear footing. This work searches for an articulation of place hovering at the margins of the urban landscape. Whether the occurrences at these locations were dramatic or banal, real or imagined, a remnant exists. The sites express an intentional unease, as a sense of displacement mirrors our current culture of insecurity and longing. My series, titled High Desert Crossings, deals with the Mojave Desert. This region, referred to by locals as the “High Desert,” is marked by military use, mining and the aviation industry. In recent times, new housing developments have sprawled out here as well, beckoning brave commuters with the prospect of affordable homes beyond the periphery of the city. I was interested in how this barren and remote space between the metropolitan areas of Los Angeles and Las Vegas is being used. And I was fascinated by looking at the traces that history left on this place – from the treks of the early settlers to the birthplace of Spaceship One – and their potential to tell us about the social geography and the state of mind of today’s America. I do not use a strict documentary approach. 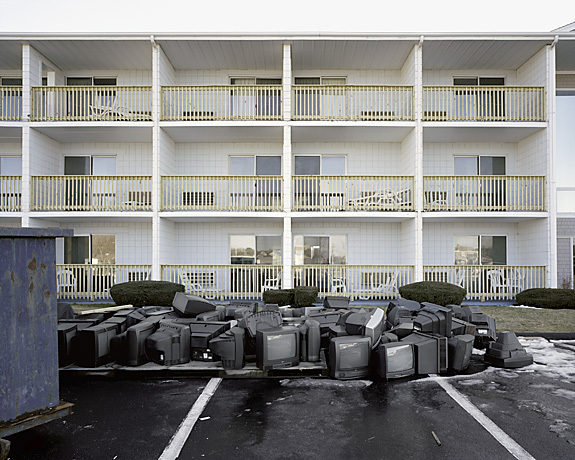 Many of my images are subjectively-charged descriptions of places and situations. 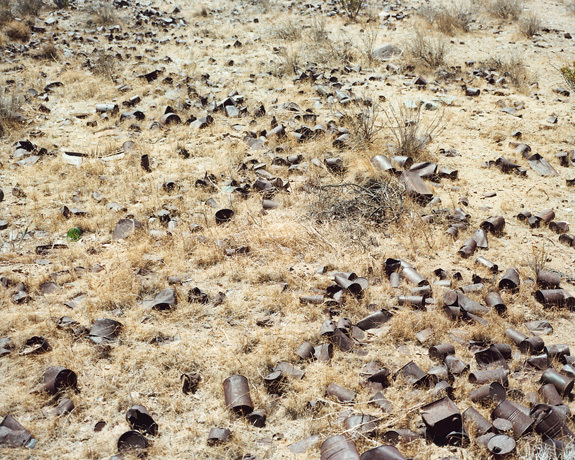 They become a projection screen for various representations, from our collective visual memory, of the American West. My practice involves extensive observation and exploratory research of a historical or changing landscape, built environment or interior space. The Liminal Points project is a re-exploration of Penn Wood, Buckinghamshire and a journey back to a vivid childhood fantasy. The term “liminality” stems from Latin “limen,” meaning boundary or threshold. Concepts of boundaries exist in all aspects of humanity and have been the study of many ethnologists, folklorists and philosophers. In particular, Plato considered the boundary between reality and a heightened reality or altered state of mind. 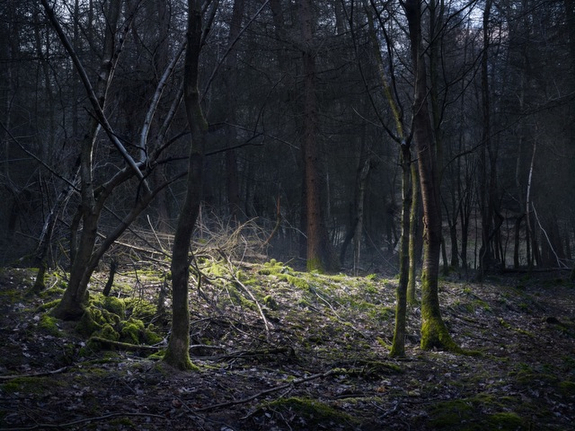 Working at dawn, dusk and night, blending natural and constructed lighting techniques in conjunction with elements from the landscape, the betwixt, large-scale images lie in a place that is somewhere between realities, as if you have stumbled upon a happening. For the artist it is a raw, solitary experience and a manifestation of contemplations on the wider world. There is a power nature holds when one is left alone with it and something that resonates in all people. Visually inspired by cinema of the late 70’s and early 90’s and writers Katushiro Otomo and J.G. Ballard, the work collaborates with childhood friend Greg Haynes and the influential music of producer Deepsea. These different creative elements form new levels within and around the work. I remember that, soon after arriving in Switzerland, the idea of a country enclosed within Europe, without any direct access to the sea, was intriguing to me. I wanted then to build a catalogue of landscapes evoking this feeling of isolation. 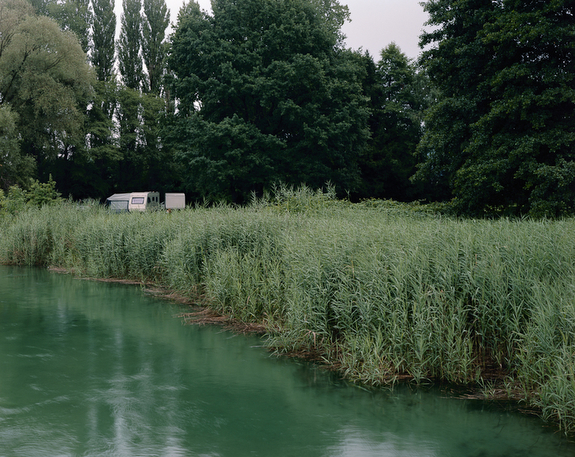 So I went photographing places located at the immediate vicinity of the Swiss border. However, it soon became evident that there was a discrepancy between what I actually photographed and what I initially foresaw. These photographs were not representing isolation. These photographs were possibilities. These photographs were other horizons. I traveled to Berlin for the first time without any preconceived ideas and little literary or film references of the city: Wenders, Fassbinder, Tresor techno music and Bpitch Control and a novel that marked my childhood, Christina H.
During our stay, we decided to enlist the help of a guide, Alex, who worked as a guide only on weekends. We found out that he was a recognized painter from Girona and an expert of the city and its culture. 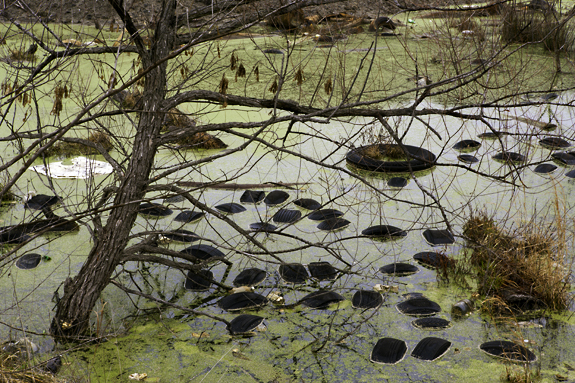 The Tar Creek Superfund Site in Oklahoma, USA is the largest and most heavily polluted toxic site in the country, and was designated a toxic Superfund Site by the federal government in 1983. This 40-square-mile area of northeastern Oklahoma includes five cities with a combined population of over 30,000. At least half of the polluted land is on one of a dozen Indian reservations. The air, ground and water is severely contaminated with heavy metals including lead, zinc, iron, cadmium, and arsenic, due to more than 80 years of mining activity. In addition, the area is plagued with open ventilation shafts and constant mine cave-ins. Approximately 75 million tons of chat (mine tailings which contain dangerous levels of toxic metals) remains on the surface of the ground. I am attempting to document not only the current environmental problems found here but also to understand and demonstrate through my photographs the population’s close relationship to this land — and that in spite of the obvious hazards, they are reluctant to leave. 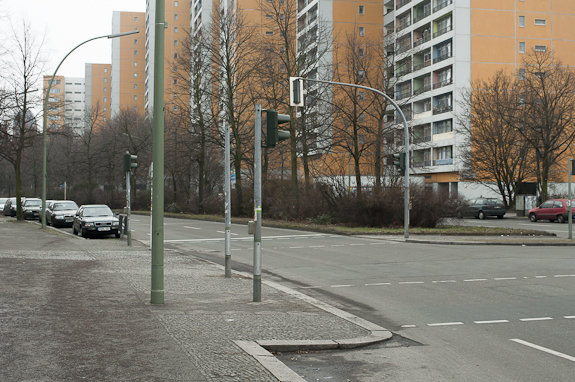 The deserted spaces of the East European national borderlands are spaces in flux. Devoid now of border controls, they are in the process of being decommissioned and abandoned. This shifting of political and economic position, after centuries of conflict, to one of a willingness to engage in dialogue, mutual interest and the need for engagement coincided with the internal migratory shifts of people out of social and economic necessity. No longer points on a map, but neither fully blank spaces, they are spaces-in-between, and are difficult arenas to absorb and comprehend. These places, which were once forbidden spaces on the map, contested, ambiguous and politically charged, now reveal themselves as lonely halfway places, impotent of their political and social significance. 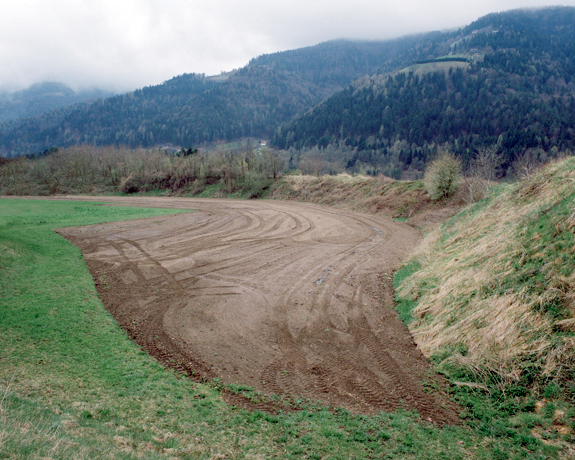 This photographic series tries to seek out the physical evidence of the transitory nature of the present-day European border checkpoints and crossings and what it says about the relationship between society, identity, architecture and the landscape in a united Europe. In 2007 I attended for half a year the Dublin University of Technology in Dublin, Ireland. Back then, the economic growth was not as huge as it had been in the second half of the nineties, but from 2001 to 2007 the Irish economy was still booming. I will never forget paying 500 Euros rent for a shared room, whereas in Holland I paid 300 Euros for a private one. This was largely due to the growth in housing investments — which more than doubled between 1996 and 2006. Taken into perspective with today’s knowledge, this was one of the reasons why Ireland was hit so hard during the 2008 economic crisis. With investments this big, you can imagine how many construction sites were popping up in Dublin. 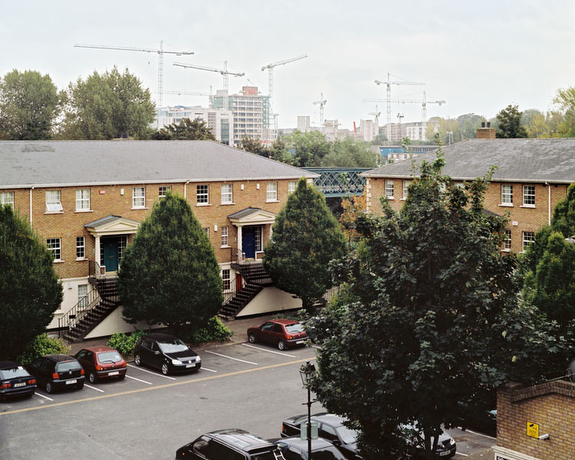 This change of landscape reflected “The Irish Boom” more than anything for me. 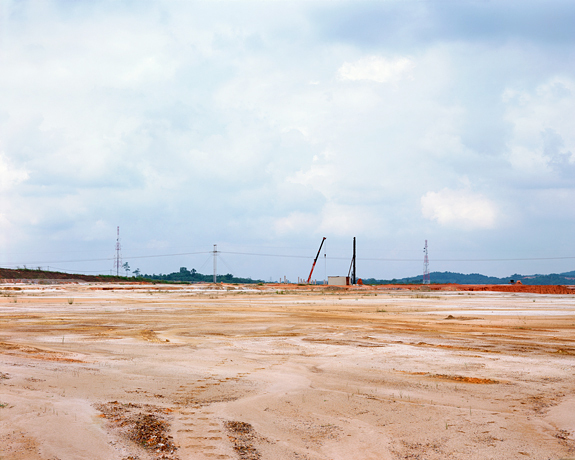 The main focus of the series is the areas where the largest part of the expansion took place: the fringe of the city, where vast amounts of empty land were made ready for construction. This is also where the series derived its title: Dublin Border.